Lift More, Live More This Summer! What's the use of having a beach body if you're too busy working out to leave the gym? Simplify your training this summer with this airtight four-day split! Depending on where you live, you may have to train in a gym for four, six, or even as many as eight months out of the year. So when the clouds part you can finally get the chance to step outside, barbecue, and chill with your friends, why wouldn&apos;t you take advantage of it? Don&apos;t get me wrong; there are few things in life more exhilarating that going in the gym and getting after it, or crushing a big workout. But as I get older, I also realize there&apos;s more to life than training. If I can dial my time in the gym for a few months and enjoy some of the other stuff that life has to offer, when I go back in the fall and really get after it, I&apos;m always fresh and ready to go. If you want to maximize your results in the gym, while simultaneously minimizing your time there, this program is just what you&apos;ve been waiting for. What you do with all your extra time is up to you! Believe it or not, you can train in a minimalist style and maintain what you&apos;ve got and even improve. But here&apos;s the catch: There&apos;s no room to screw around. You need to go into the gym with an airtight plan in mind and follow it. So let&apos;s break down the rules that will guide you in your summer training. If you want to minimize time in the gym, you need to maximize the quality and focus of your training while you are in there. If you want to minimize time in the gym, you need to maximize the quality and focus of your training while you are in there. Going in and repping curls for 30 minutes isn&apos;t going to cut it. Minimal time doesn&apos;t equal minimal effort or intensity. The focus needs to be on big, compound lifts that utilize as much muscle fiber as possible. Don&apos;t worry, this doesn&apos;t mean you&apos;ll go all summer without touching an EZ-bar. If I told you to do that, you probably wouldn&apos;t listen anyway, right? So you&apos;re just going to earn your curls and skullcrushers. When I trained Indiana Pacers center Roy Hibbert we would put in high-quality work up front during his session. But at the end, he loved what he called "icing on the cake." That detail work will still fit in this program. Despite what many people say these days, I believe there are benefits to both low-intensity, long-duration cardio and high-intensity, short-duration cardio. Don&apos;t let anyone tell you otherwise. If time is of the essence, or if you&apos;re looking to get maximal benefit in minimal time, high-intensity interval training is the way to go. We wrap up two of our four sessions with cardio to make sure you&apos;re lean and in shape. Summer is the ideal time to fulfill your activity needs far away from the gym. Why needlessly pound away on a treadmill or elliptical machine when you can go outside, get some fresh air, and put all that strength and athleticism you&apos;ve been building to good use? Whether it&apos;s recreational biking or hiking, or maybe something more competitive like joining a summer sports league, your options are nearly limitless. The key is to find something you enjoy doing so you actually do it on a regular basis. Now that I&apos;ve laid out the ground rules, let&apos;s delve into the program. As promised, this program is all about focusing on the basics. A high-intensity interval session as a finisher. I don&apos;t care whether it&apos;s a front squat, back squat, or something in between. Everyone has their own preference here, so choose whichever version works best for you and allows you to push the weight a bit. No matter what type of squat you favor, the big thing to focus on is keeping the feet, knees and hips in a straight line, and to think about pushing or driving away from the ground. Follow up the big squat with a split squat variation; this builds stability in the hips and core, hammers the glutes and adductors, and works to iron-out any side-to-side imbalances you might have. Finally, finish off the strength portion of the session with ab wheel rollouts. Focus on exhaling fully and rounding the back, then try to hold this position for as long as possible as you roll out. Don&apos;t allow the back to arch or extend! Then return to the starting position. When you&apos;ve done that, it&apos;s time for what I&apos;ve named the "Leg Matrix." This 4-movement circuit mixes vertical jumps, bodyweight squats, alternating lunges, and step-ups, ensuring you hit your legs from every angle while they&apos;re still aching from the squats. This is a grueling way to finish any workout, but especially a leg workout. Hit these hard and rest only by the guidelines I recommend. This will blowtorch fat and make sure you don&apos;t want to train legs for a few days afterward! Everyone loves bench press day, so I&apos;ve make sure to keep that in your program. We&apos;re going to follow the same set and rep scheme for all of our main lifts, so all you have to do is pick the bench press variation which works best for you. If you have dodgy shoulders, go with a neutral grip and dumbbells. If you&apos;re a traditionalist or a powerlifter, stick with the standard barbell variation. The bottom line is to push some weight and make sure to stick to those rest periods. The superset includes a push-up variation, which hits the body a bit differently than the bench. Some of my favorite variations include feet elevated push-ups, push-ups on medicine balls, or any sort of loaded variation, such as wearing a weighted vest or with a plate on your back. Finish off with a Swiss ball jackknife to finish off the upper body, and keep that core tight and on point. For your finisher, you do some hard triceps work: superset skullcrushers with close-grip bench presses in a descending ladder. Just because this isn&apos;t the primary focus of your workout doesn&apos;t mean to sandbag here. If it&apos;s summertime, you might as well look jacked! Hopefully you&apos;ve recovered from squat day by now, because it&apos;s time to hit the backside of the body in our second lower-body training session. Pick your favorite deadlift variation—trap bar, sumo, or conventional deadlift. These the variations allow you to move the most weight and recruit the most muscle, so they&apos;re the only ones acceptable for this particular program. As the saying goes, "If the bar ain&apos;t bendin&apos;, you&apos;re just pretendin&apos;." From there, you&apos;re going to perform a single-leg RDL in a superset with a dead bug. To get the most out of the dead bug, focus on exhaling fully and gluing your lower back to the ground. Don&apos;t let the back extend at any point during the movement. Kettlebell swings on the minute are your finisher today, and they&apos;re a great one. Word to the wise, they&apos;re also a great workout on their own when you&apos;re in a pinch. Wait for the second hand on a clock to get to the 12, and then perform 10 kettlebell swings, or 12 if you&apos;re a boss. Put the kettlebell down and relax for the rest of the minute. Start with 10 rounds, and try to add 1-2 rounds each week. Not only will this leave you out of breath, but also sore on the backside for days to come. Enjoy! I know some of you are lamenting the fact that I&apos;ve excluded direct biceps work from the main program thus far, but never fear. I&apos;ll more than make up for that in our finisher today. I promise. The chin-up part of today&apos;s workout is standard. 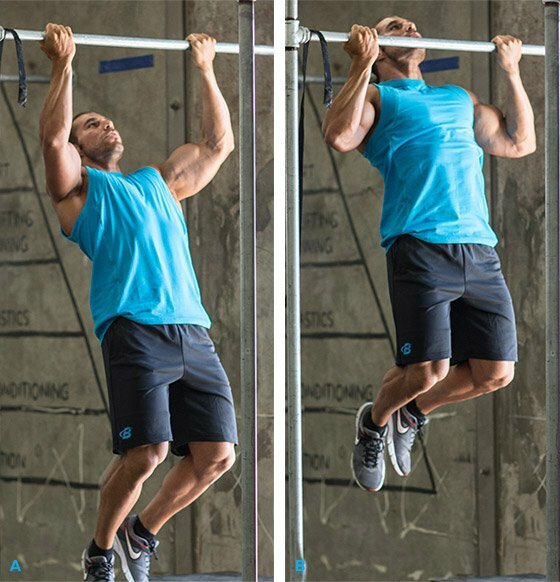 Use chin-ups, where your hands face you, rather than overhand pull-ups—just make sure to keep your upper arm mass where it needs to be. Think about pulling through the elbows and, if possible, touching your chest to the bar on every rep.
For the Palloff press, stand next to a cable machine with a D-handle set to approximately chest height. From this position, grab the handle and step 1-2 feet away, and then press it out with both hands in front of the body. Focus on standing up tall and not allowing the cable to rotate you. Hold for the prescribed time, and then switch sides. Finish off with some old-school biceps work. I know what you&apos;re saying: Curls as cardio? What a country! While it&apos;s easy to pump and cramp your way to feeling like you got a good workout, sometimes you just need to simplify things. To finish off today, grab an EZ-curl bar and load it up to a respectable weight. From there, just do 5 sets of 8 reps with 30-60 seconds rest between sets. If you&apos;ve been honest with your pull-ups, you might be surprised how much you&apos;ll huff and puff! The goal is to push some weight and struggle at the end, but mostly to just finish the biceps off. If you put in the work up front on the chin-ups and rows, the base will already be there. Perform all four exercises with no rest. Time how long it takes you perform a set, and then rest that long between that set and the next one. Repeat 2-4 times. 8 sets of 5 reps, 60 sec rest. Use barbell or dumbbell bench press. Use either front or back squats. A lot of people get stuck in middle ground training in which they neither gain the muscle size nor the strength they want. There&apos;s a fix for that. If your rep scheme isn&apos;t getting you where you want to be, then add an additional exercise to snack on after the main course. Rest when you&apos;re dead! Going beyond failure doesn&apos;t have to put your spine at risk. Discover cheat-centric reps and add a valuable new muscle-building tool to your arsenal!